We all want to believe that we can rely on the good judgment of decision makers when they make decisions that affect organizational performance. But they're human, and they are therefore subject to a cognitive bias known as self-serving bias. Here's a look at what can happen. Daffodils of the variety Narcissus Barrett Browning. 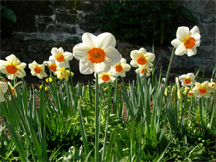 Narcissus, the scientific name of the genus commonly known as daffodils, is a name taken from Greek mythology. Narcissus was a hunter known for his beauty, of which he was very proud. In the myth, Nemesis, who was the goddess of revenge or divine retribution, became aware of Narcissus' extreme pride, and attracted him to a still pool, where he saw his own reflection. Narcissus fell in love with his reflection, unaware that it was just an image. He became unable to leave it, and soon died. Self-serving bias is blind in the same way. When we're under its spell, we?re unaware of it. We cannot see that our judgment is distorted — only others can see the distortion. Photo courtesy www.nps.gov/media/photo/view.htm?id=FA2D1735-155D-4519-3EDB376118F7A8A6. Self-serving bias is an example of a cognitive bias, which is the human tendency to make systematic errors based on thought-related factors rather than evidence. Cognitive biases are detectable by comparing the judgments people make when they are inside a given situation to the judgments they make when assessing the same situation from outside. Self-serving bias is the tendency to attribute our success and triumph to our own skills and talents, and our failures to situational factors or to the actions (or inactions) of others. As a humorous example, self-serving bias is probably the reason why all the children in Lake Wobegon are above average. Here are examples illustrating how self-serving bias affects organizational decision-making. In lessons-learned or after-action exercises, teams are subject to self-serving bias, and its related group form, group-serving bias. These biases create a tendency to attribute to external factors anything that went wrong, while attributing to the team's own deeds and abilities anything that went right. control managersacknowledging risk entails acknowledging vulnerability. Self-serving bias makes us more likely to acknowledge risks related to external situational factors than we are to acknowledge risks arising from our own shortcomings, our team's shortcomings, or shortcomings in our plans. Because self-serving bias can make us reluctant to acknowledge internal security threats, systems tend to be better defended against external threats than they are against threats from within. Since bureaucratic controls are designed to meet the goals of management, self-serving bias leads to emphasis on employees who are managed, rather than the managers themselves. Bureaucratic controls tend to control the managed more effectively than they control managers. When bonuses are distributed in outsized proportions to those who determine the distribution pattern, many see this as a manifestation of simple greed. But self-serving bias almost certainly plays a role, because it tends to make those who determine the distribution pattern attribute more of the organization's success to themselves than to others. Conversely, when layoffs and cost reductions hit harder those people of the organization most removed from decision-making, self-serving bias probably plays a role as well. In negotiations, self-serving bias creates risk of impasse because each party tends to overvalue arguments in its favor, and undervalue arguments in favor of their negotiating partners. Are your projects always (or almost always) late and over budget? Are your project teams plagued by turnover, burnout, and high defect rates? Turn your culture around. Read 52 Tips for Leaders of Project-Oriented Organizations , filled with tips and techniques for organizational leaders. Order Now! Read more about self-serving bias at Wikipedia. Would you like to see your comments posted here? rbrenoyxGNVIUTQwuZcocner@ChackSBLBvTLMmSuTsXJoCanyon.comSend me your comments by email, or by Web form. Dramatic changes in policy or procedure are often challenging, especially when they have some boneheaded components. But by accepting them, by anticipating what you can, and by applying Pareto's principle, you can usually find a safe path that suits you. Look around your office. Look around your home. Very likely, some of your belongings are useless and provide neither enjoyment nor cause for contemplation. Where does this stuff come from? Why can't we get rid of it? Risk Management Risk is the risk that a particular risk management plan is deficient. Here are some guidelines for reducing risk management risk arising from risk interactions and change. Time is the one workplace resource that's evenly distributed. Everyone gets exactly the same share, but some use it more wisely than others. Here's Part I of a little catalog of ways we waste time. Although most organizational policies are constructive, many are outdated or nonsensical, and some are actually counterproductive. Here's a collection of policies that would be funny if they weren't real. See also Personal, Team, and Organizational Effectiveness, Emotions at Work and Cognitive Biases at Work for more related articles. I offer email and telephone coaching at both corporate and individual rates. Contact Rick for details at rbrenbWkdouhjUdyLsuNxner@ChaclmCHxnuAAcoVccQkoCanyon.com or (650) 787-6475, or toll-free in the continental US at (866) 378-5470. Virtual Team or Virtual Catastrophe? Learn how to make your virtual global team sing. Are you managing a change effort that faces rampant cynicism, passive non-cooperation, or maybe even outright revolt? Are You an Ace at What You Do? Exchange your "personal trade secrets" — the tips, tricks and techniques that make you an ace — with other aces, anonymously. Visit the Library of Personal Trade Secrets.